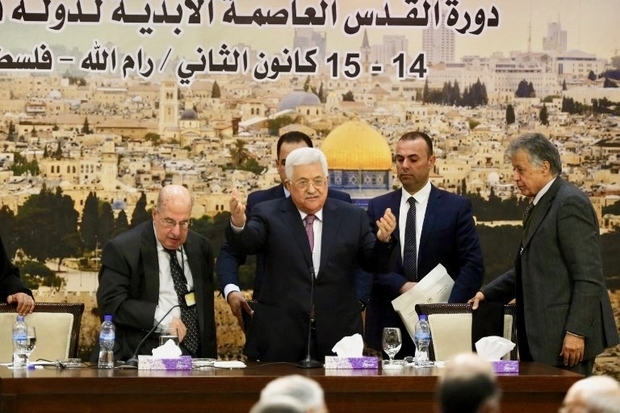 In a two-hour speech by Mahmoud Abbas to the PLO’s Central Council on Sunday night in Ramallah, the aging Palestinian president gave a quintessentially Palestinian talk – blaming everyone for his people’s problems but himself. The low lights of the diatribe against the world by the “president”, who today began the 14th year of his 4 year term, included his wish that ‘God may demolish the house’ of Donald Trump. He also criticised Hamas, Islamic Jihad, his critics within his Fatah party and the Europeans, who he blamed for Palestine’s Jewish problem. Israel, he insisted, “is a colonialist project, which has nothing to do with the Jews.” Abbas also traced the beginning of Zionism to what he called the Theodor Herzl’s efforts to “wipe out Palestinians from Palestine”. Abbas also promoted the conspiracy theory that “Israel has imported frightening amounts of drugs in order to destroy our younger generation”. Thus far, only the Telegraph covered Abbas’s speech. However, their 620 word article, which included every other incendiary remark by the octogenarian leader, completely ignored his ahistorical, antisemitic and conspiratorial claims. The Telegraph’s omission is but one example within a broader media pattern of obfuscating or ignoring incendiary, pro-terror or antisemitic remarks by the ‘moderate’ Palestinian leader. Last month we noted the UK media’s failure to report on an antisemitic accusation by Abbas, during a speech in Istanbul, that Jews are liars by nature. And, last year we posted on the media’s silence following Abbas’s remarks to the EU Parliament evoking a medieval antisemitic libel by accusing Israeli rabbis of calling for their government to ‘poison Palestinian wells’. Update: Shortly after this post was published, we learned that Sky News, The Independent and ITV News all reported on Abbas’s speech, while similarly omitting his comments about Jews. Its totally outrageous that Great Britain finances Fatah terrorists and turn a blind eye to their savagery. The BBC is silent about the juicy parts too. “Israel claims the whole of the city as its capital. The Palestinians want East Jerusalem, occupied by Israel in the 1967 Middle East war, to be the capital of a future Palestinian state. Well, shucks. Now I feel so well informed! Thanks BBC for the slanted reportage and giving the wrong impression consistent with the position of your Palestinian allies. I didn’t know that Trump recognized all of Jerusalem as Israel’s capital (because he didn’t). But, then again, I listened to the actual speech instead of the unerring and unbiased coverage of the BBC with its lies of omission. I have read exactly what Abbas said. Nearly everything he stated is garbage. The really important thing to note is that he HAS to say these things. To acknowledge publicly Israel’s right to exist (which he does in private meetings) would lead to his virtually assured assassination. In other words Abbas is a puppet of the extremists, yet people worldwide do not seem to have understood that. To really combat Islamic extremism one has to at least know how it works in practice. Don’t let Abbas or his PLO off the hook. They have had a huge hand in radicalizing the people who would have their heads for compromising. He has had decades to simmer down the rhetoric and hate. He is leader of the most antisemitic Arabs in the Arab world (according to polls), and that’s saying a lot. “To acknowledge publicly Israel’s right to exist (which he does in private meetings) ” Which private meetings would those be? With Hamas? He did it in a private meeting with Michael McCann who was the Labour MP for East Kilbride until 2015 and is also the chair of the Israel Britain Alliance. But when invited to say so publicly he brought the meeting to an abrupt end. Err, no. Abbas IS an extremist. Not to worry UK is being overrun buy a deluge of radicalized Islamic immigrants. They will receive their just reward.